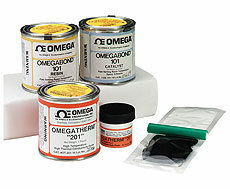 OMEGATHERM™ thermal conducting paste is a high thermally conductive and high temperature thermal paste product. They are specially formulated for permanent and temporary bonding of thermocouples, thin film RTDs, thermistors and other temperature sensors, to most surfaces–metals, ceramics, glass, plastics, paper products. OMEGATHERM™ 201 — is a very high thermally conductive filled silicone paste, ideally suited for many temperature measurement applications. This thick, grey, smooth paste wets most surfaces and will not harden on long exposure to elevated temperatures. It is rated for continuous use between -40 and 200°C (–40 and 392°F). a) Surface Measurement Probes — dab a small amount on the surface and push the sensor into this area. b) Temporary bonding and encapsulating of temperature sensors — simply dab OMEGATHERM™ 201 onto the surface or in the cavity, plant the sensor in the paste, and tape to hold in place. This versatile heat transfer paste is supplied in 14g and 56g jars, as well as in 450g and 900g containers.